[Around 5 a.m., Friday, Feb. 21], deputies with the LAN-CAP Team and the Special Enforcement Bureau served a search warrant during the early morning hours at a home located on the 45000 Block of Rodin Avenue. Inside the home, they located approximately 4 pounds of marijuana, about 50 grams of heroin, and methamphetamine. Also discovered in the home was approximately $600 in cash, scales, two firearms, ammunition, and several possible stolen electronic items. Five small children (four girls and one infant boy) were also taken into protective custody and held for the Department of Children and Family Services. Eight adults were located in the house and were arrested for multiple drug and firearms charges, ranging from possession of marijuana for sales to child endangerment, and additionally charged with gang enhancements. They were all booked at the Lancaster Station Jail and held on various bail amounts. 7 comments for "8 busted in Lancaster drug raid, 5 kids in protective custody"
If found guilty, 10 years, one meal a day, clothes changes once month. no more free medical or dental. Nothing but books. 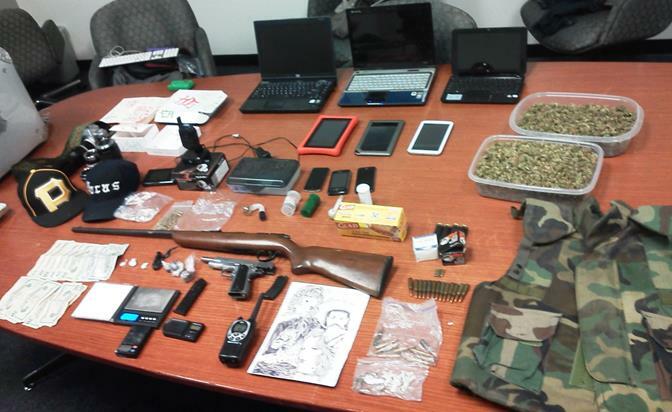 Great job goes out to the LAN-CAP Team and the Special Enforcement Bureau! Looks like these guys and gals weren’t the only ones getting busted this weekend. Hopefully the city gets the house and any cars. Clean this town up!!! Where did the 4 LBs of weed go? The weed in the picture is only about 4 OZs. Who is burning the evidence? Looks to be two large plastic containers full to me.